Out of the nearly 700 postings I have written for Passion for the Past, I would venture to say that only around a dozen - maybe a dozen and a half - are about the 20th or 21st century. Count today's post among those, for it centers on a couple friends of mine who enjoy - really enjoy - spending time in America during WWII. Their passion for the period and their research is an inspiration. I received the box set of the Tom Hanks HBO mini-series Band of Brothers and The Pacific for Christmas. What an amazingly true-to-life set this is, showing both the European and Pacific theaters of war in all its intensity and realism. Both series were produced by Tom Hanks (who also produced the amazing John Adams HBO mini-series), and Steven Spielberg. I wish the two men would continue in this vein...you know, bringing American history to life. These are not your typical Hollywood History garbage strewn out with big names to make a buck; instead they are filled with top-notch quality depictions of battles and even life on the homefront. Realism at its finest. So as I watched this WWII box set, which, in its entirety, has twenty episodes total, I began to think of the reenactors who portray this era. I have a few friends who absolutely love this early 1940s time of boogie woogie, Rita Hayworth, streamline cars, Clark Gable, classic movies, and Bing Crosby. And I thought I would throw the spotlight on a couple of young women who have taken the 1940s citizen patriot to a high level. Each have spent years as ladies of the 1860s, and each has also been period-dressed presenters at historic Greenfield Village in Dearborn, Michigan. So it's suffice to say they do know their history pretty well. 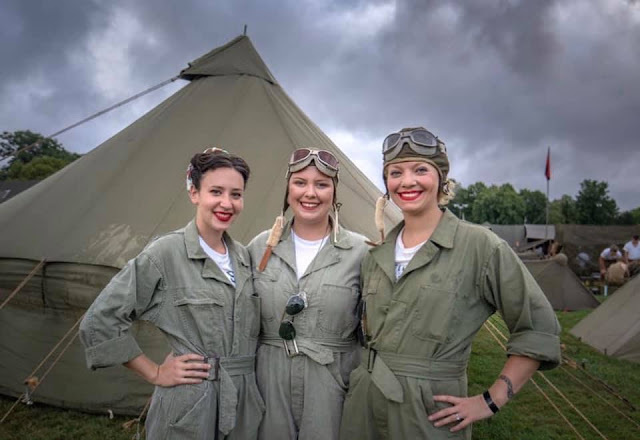 Though the ladies love to dress in the clothing of the mid-19th century, they have also found the era of WWII America - the early 1940s - to be a fascinating time for women. The idea that so many Civil War reenactors, both men and women, have ventured out to other times in history is intriguing to me. I mean, I'm no different, for I also reenact in two different periods, but both of mine are pre-20th century, so the idea of my two friends finding an interest in the 1940s piqued my interest, and I set out to learn more of why they chose the later period rather than remain in an earlier time. I think you will enjoy what you are about to read (and see), even if the 1940s are not your cup of tea, for their passion of the past shows. 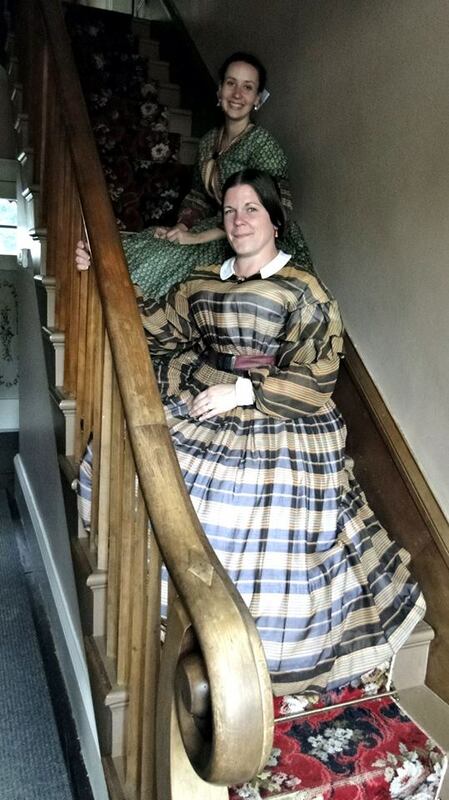 Beckie is a long-time living historian and seamstress who has been a Civil War-era reenactor for over a decade. I'm also proud to say that she is a member of my period vocal group, Simply Dickens. When I queried her on the passion she has for the time of her grandparents, she gave me this explanation: "The first time I participated in a 1940s event was for Wyandotte's Victory Rally (in Wyandotte, Michigan). I think it was 2012. I was volunteering at the Wyandotte Museum and was asked by the then director to help. She wanted a home front vignette and I agreed to help with it." So she and her friend Donna, for the first time, went into the public eye to represented the home front and talk to visitors about "how ladies did their part towards the war effort." Please understand, Beckie doesn't do anything lightly - she especially takes her history seriously, and because of this she wanted to feel totally immersed in the era and decided that dressing the part would be the best way to present it. "I made a dress and apron from some patterns of the era and made sure I was dolled up from head to toe," she said. "It was a blast! We showed another side of the war that most people don't see. The struggle was real at home and those left behind had to learn how to make due without things that many of us take for granted today." She was very pleased at the "tons of compliments on our display and our presentation," but the best one she received was from a gentleman who "told us we looked beautiful and reminded him of his mother. He told us that women in the 1940s were so elegant and classy, and our presentation of the era brought back some great memories. At that point, I was hooked!" 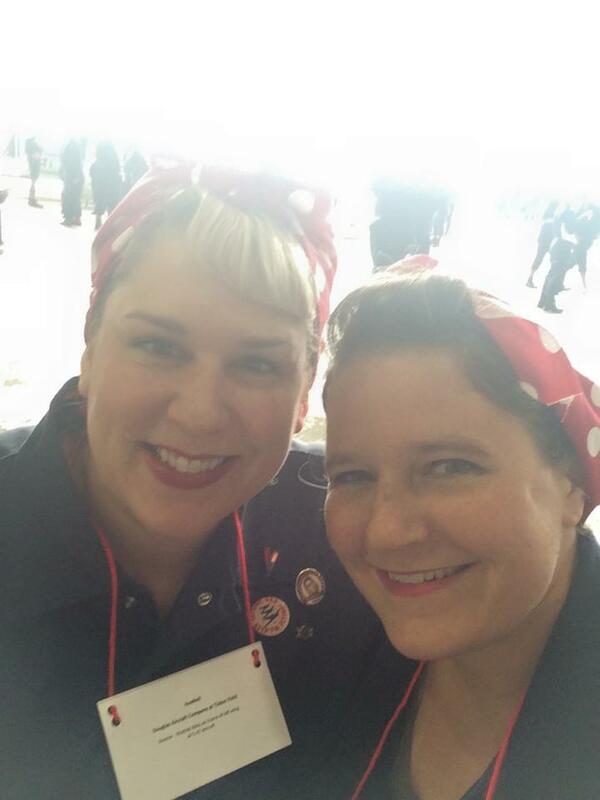 Donna & Beckie at their first-time-ever representation of 1940s women. So Beckie took a giant feet-first leap from the 1860s and "When Johnny Comes Marching Home" to the 1940s and "Don't Sit Under The Apple Tree With Anyone Else But Me." As she herself put it, "The more I researched the period, the more I started to love the look and the entire era. Women and men both looked clean and polished, even when they were in comfy clothes. People got dressed up to go to the grocery store! Who does that now-a-days?" To help get herself in the mood, she will watch some of her favorite movies from or about the era, such as Pearl Harbor from 2001 ("I cry every time the Japanese start bombing, the pain and fear they must have felt"), Hacksaw Ridge, Life is Beautiful, and Casablanca (of course! ), just to name a few. She also enjoys listening to 40s music. "My Sirius is usually set to the 40s Junction channel when I climb in my car, and I've got a large playlist that I'm continually adding to. I also have a huge stack of records that I listen to often when I'm sewing." As a Civil War reenactor and seamstress, Beckie has always enjoyed researching the clothing of the 1860s, and it was a natural segue into the world of bright red lipstick, wavy hair, and skirts & blouses. "There are a lot of patterns out there that allow me to sew my own outfits, which makes this seamstress super happy." And then there are the websites like pinterest to help her with hairstyles and makeup. "I've got the makeup thing down but I'm still working on the hair," she told me. "For ladies back then, the hairstyles were no big thing because they did them every day, like us throwing our hair in a messy bun today. I'm a work in progress." Hey! This could be my mom! Or at least one of her older sisters. But it's not just the girly fashions of the home front that Beckie enjoys, for being the historian that she is, she is quite aware there was a war on, therefore she takes the time to research the military factors. She admits that she doesn't know as much about the battles as she would like, but is gaining knowledge through her adamant research. However, she is also learning about how the ladies participated in the military: "My Aunt Alice was a Lieutenant first class JG in the WAVEs, a branch of the Navy, and that sparked me into looking into different branches," she said. "I'm considering doing a WASP (Women Airforce Service Pilots) impression." 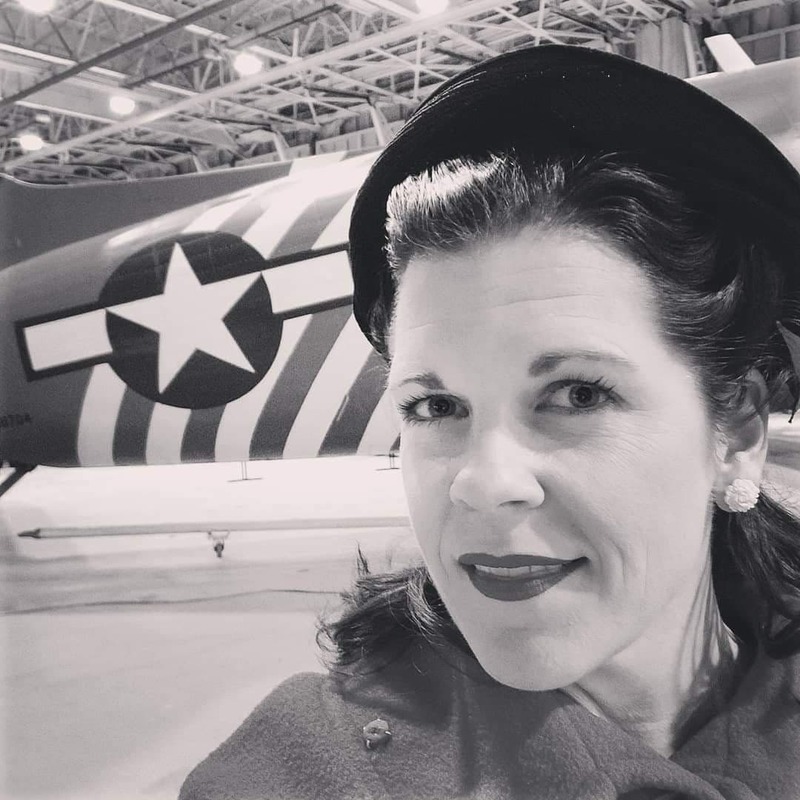 These days Beckie mainly spends most of her time representing a Rosie the Riveter at the Yankee Air Museum in Belleville. "I absolutely love being a tribute Rosie! 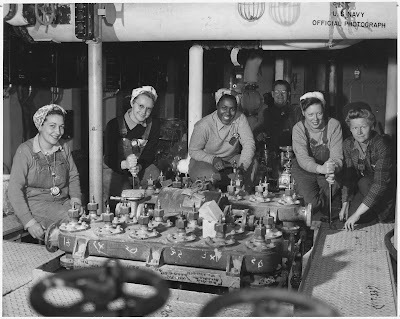 I have the chance to show the strength of these fantastic ladies who did their part in the home front, building bombers, driving buses and taxis, working in banks and offices." Basically doing things that were not considered lady like, as she put it. But it was because it was their duty to their country that these 1940s women stepped out of the confinement set up for them by previous generations. And she is proud to represent those women that did step out. "I strive for authenticity so my jumpsuit is based off of a WWII air raid suit, which was used protect clothing during air raids." And she proudly exclaims, "I was even told that my jumpsuit looked like the jumpsuit an original Rosie wore when she worked on the line!" If that doesn't confirm her interpretation, I couldn't tell you what would. 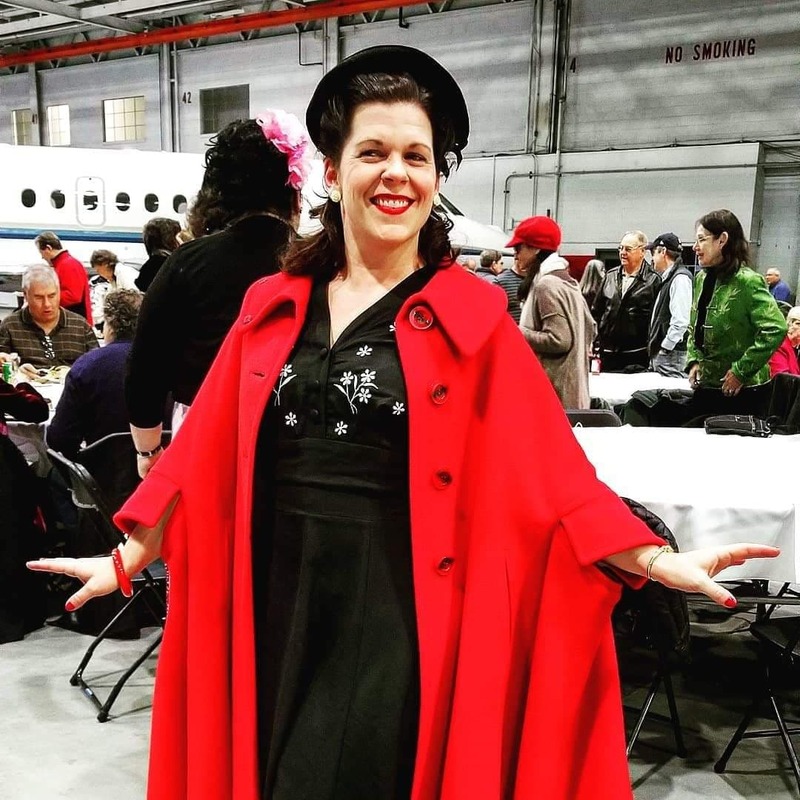 She also explained that, "The job of the Rosies from Yankee Museum is to inform people of who Rosie was and what she did towards the war effort and to help raise funds to save the last remaining piece of the Willow Run bomber plant, where the B-24 Bomber was built." They have a drill team, of which she is a part of, that marches in parades all over the state to help raise awareness. "We're like those briefcase guys but way better." In fact, in 2018 they were invited to march in Washington DC's National Independence Day Parade! "It was fantastic and we actually got to stop in front of the review stand to perform." Only two sugar ration stamps left. 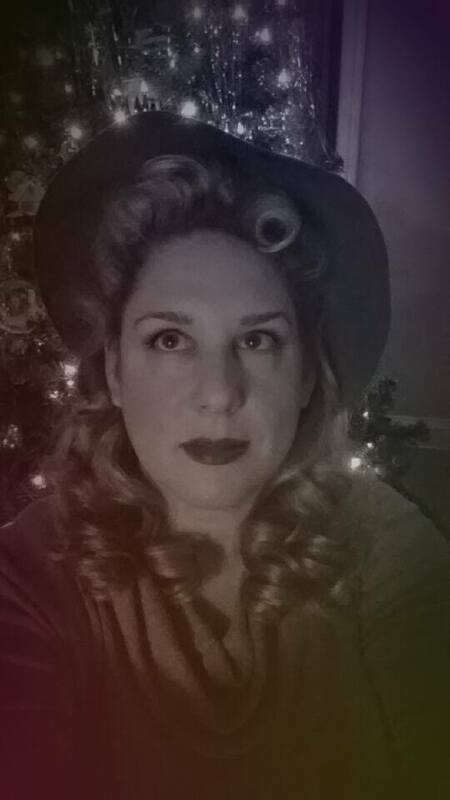 Something else Beckie likes to do is to bring as much of the 1940s era into her present life as feasibly possible. And those of you who read this blog consistently are quite aware of that many reenactors, including this author, does the very same of our chosen period in time. But this is not an unusual practice among those of us who participate in the living history hobby. "I am trying to pull more of the 1940s style into my everyday life. I just love the look and I want to express myself in this classy style. I'm continually researching - a history background will certainly do that to you!" However, Beckie hasn't left the Civil War behind. "I still enjoy Civil War reenacting because I get to represent a lady of the era and create a persona and outfits that complete the look," she says, "but I must admit that it's definitely nice to get out of the corset and hoopskirt. It's definitely a different experience reenacting the 1940s than the 1860s. Ladies had a very limited existence during the Civil War, although there were some standouts who did their part or disguised themselves to fight. Women in the 1940s still were supposed to be housewives but WWII recognized that women could play an important part and, at times, did an even better job then men did." There were rumors that Civil War reenacting was losing ground, that people were leaving the hobby. But then I came to realize that they weren't leaving reenacting...they were only expanding on their love - their passion - for history. As Beckie puts it, "I honestly love portraying a part of history, and the chance to do so is great. I think it makes me feel the part and it makes everyone else around me enjoy the event more." And she hopes to meet more original Rosies, "while they are still with us," and through their own personal stories, perfect not only her look, but her persona as well, for she wants to be "as accurate as possible." This is the type of fortitude we should all have when we don period clothing. 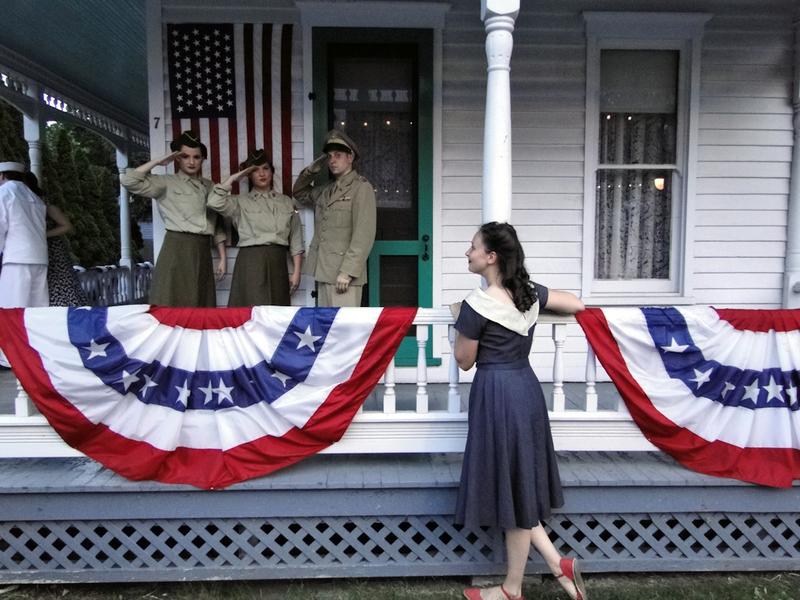 This photo was one that I set up at Motor Muster inside Greenfield Village, and it seems to show the young Jillian, perhaps as a teenager, admiring her sisters and brother for their part in the War effort. 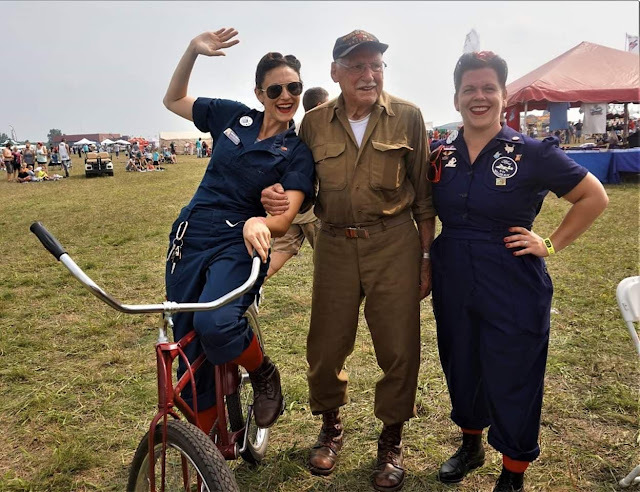 Jillian began reenacting WWII in 2017 with her first event taking place in Chesterfield Township (Mi). When I asked her what drew her to the 1940s, she replied with, "WWII is appealing to me because it is another important piece of history. Since we have people from that generation still living, it is tangible history, and we have a responsibility to help preserve their stories as much as we can." 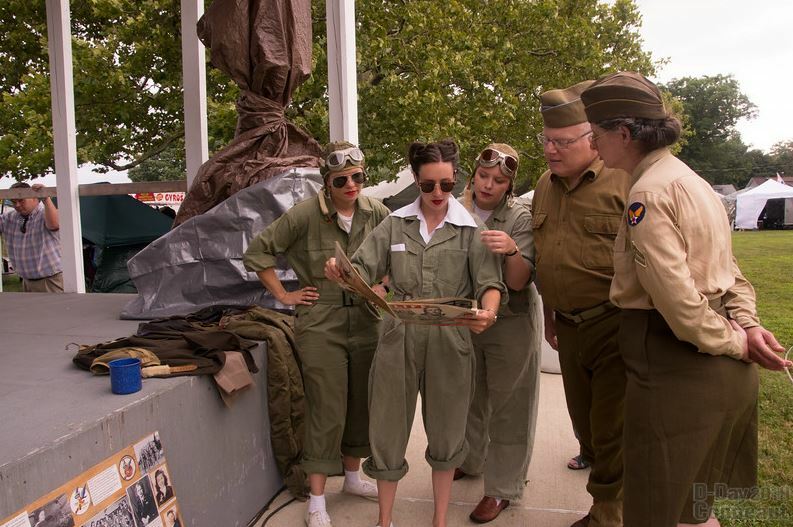 We are a small, yet mighty, group of American female “pilot” reenactors based out of Michigan, who are dedicated to authentically representing the 1,074 WASP of the Second World War. Some of the W.A.S.P.s check out the latest issue of Life Magazine. Jillian proudly stated that "The W.A.S.P.s were incredible women who were not recognized for their efforts until the 1970s. It is our responsibility to help keep their story alive." And Jillian really enjoys her role in remembering WWII, for it has "more opportunities for women to play a different type of role." of D-DAY, which took place in 2017 in Conneaut, Ohio. 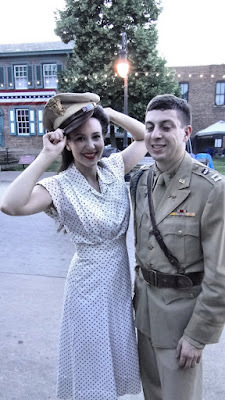 When I asked her in which era of the reenacting hobby does her loyalties lie, she responded with, "I think I have an interest in both. It’s really important to me to tell the true history of both the Civil War and WWII." During her research of Daughters of the Regiments (Civil War), she learned of the many women who were out on the battlefields, including Franklin Thompson, a woman who dressed as a man during and for a few years after the war. Thompson published a best selling book based on her experiences. As Jillian told me, "Women who did dress as men on the battlefields didn't always keep records, for they were sometimes discovered by their handwriting. I find myself learning a lot about both time periods equally." Jillian is grateful, however, to the men in Civil War reenacting that are supportive of her own role as a Daughter of the Regiment and is glad she could help bring the truth of women who truly were on the battlefield into Civil War reenacting. 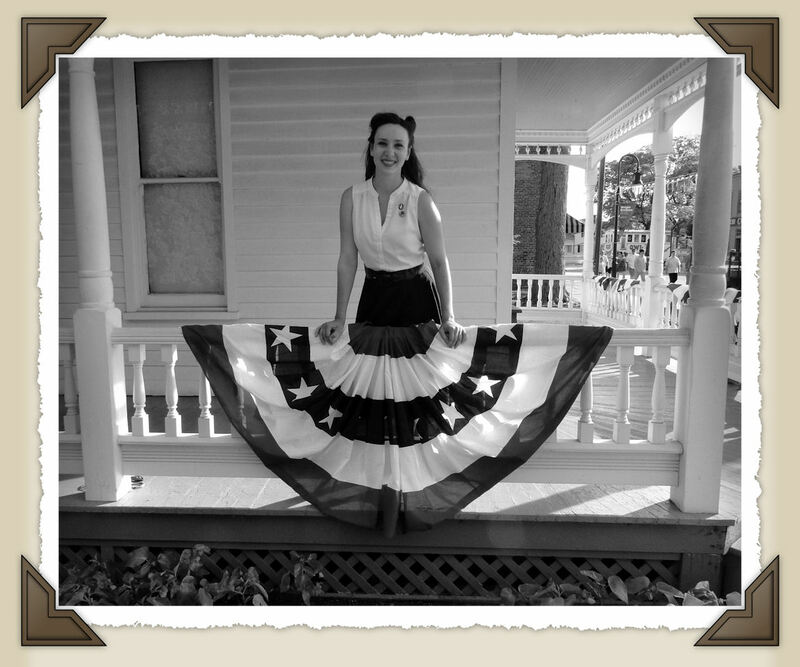 Another photo of Jillian taken on the porch of the Wright Brothers Home inside Greenfield Village. A snapshot right out of the past. Like Beckie, Jillian is also has a passion for the past and researches deep to find the little-known stories of people that deserve to be remembered and told. Now this is the Beckie and Jillian I know! Welcome back to the 1860s ladies! I want to thank both Beckie and Jillian for kindly answering my questions about their ventures into WWII. I am proud to call each my friend, whether at a reenactment or when we visit or just talk on the phone. And I know a few others who have gone forward in time to the 1940s, including men, and though it may not be "my time," I am still grateful that they are showing another important period in our Nation's history...and the world's history. As for these two lovely ladies you see on the left, here, they continue on in the 1860s as well. And, who knows? Maybe I can entice them to join me in the 1770s one day. And thank you both for allowing me usage of your photos! passion for WWII fashion and history. I'll never forget when she called me up after her first reenactment, all on fire with excitement about how she found her place in time. I could hear the passion in her, much like it is with me and colonial, and I hope she will be able to follow that passion as far as it can take her. You go for it, my friend! 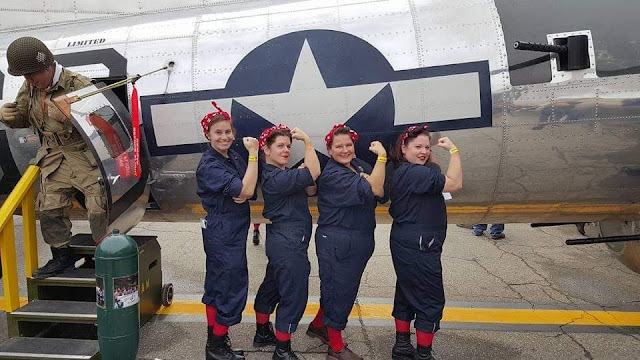 (From the Guinness Book of World Records): The largest gathering of people dressed as Rosie the Riveter is 3,734, and was achieved by the Yankee Air Museum (USA) at the EMU Convocation Center in Ypsilanti, Michigan, USA, on 14 October 2017. The Yankee Air Museum attempted to reclaim their previous record from 2014. They even had some "original" Rosies present who actually worked in the factories in WWII. The oldest Rosie present was 101 years old. 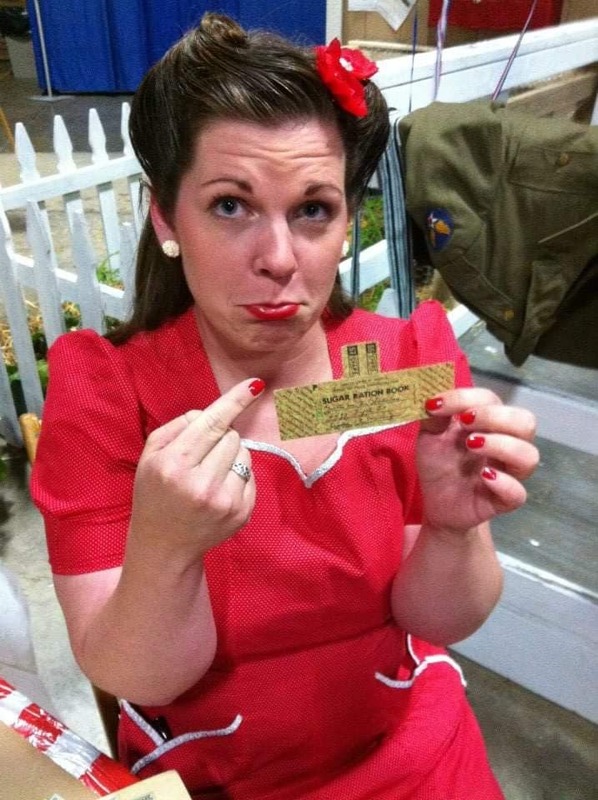 Meg is yet another friend who has found herself immersed in the 1940s. I have not been to a full-blown WWII event, though I hope to sometime soon. I think it would be very cool to see the era of my parents come to life.